Four feet of mud, water, and rock. It sounded like a "jet engine” coming down the gully and over the trail. 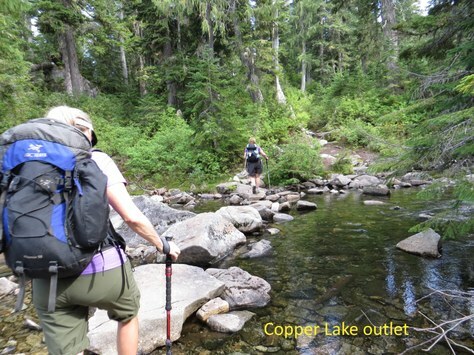 A group of ten hikers with the Seattle Conditioning Hiking Series set out from the West Fork Foss 1064 trailhead for an out-and-back hike of Trout, Malachite, Copper and (if time allowed) Little Heart Lakes. I was aware of the weather challenges that weekend, and was monitoring the forecast up to the morning of the hike. I had considered alternate destinations, but the forecast for all was equally sketchy. In addition, we had a hiker meeting us at the trailhead. We were on trail by 9am in mostly sunny conditions, and arrived at buggy Lake Malachite without incident for lunch and wading. There was light rain and a distant sound of thunder as we left the lake. The designated party sweep and I switched positions. She could lead on the way out, and I could sweep. We descended back to the Copper-Malachite Lake junction and the group decided to continue the additional .3 mile to Copper Lake for a swim and pictures. At that point I had ruled out continuing to Little Heart Lake due to the forecast. At approximately 3pm on the descent from Copper Lake, about a mile NE of Lake Malachite, light rain became heavy rain and pea-sized hail. The group stopped before what was a dry creek crossing on the way up and had since become a significant gully. A pair of backpackers and their dog were coming up the trail, but had stopped upon seeing the water flow across the trail. There was also a family group of six behind us. I was toward the rear of our group. Several witnesses toward the front heard and saw the flow increase to “four feet of mud, water, and rock — sounded like a jet engine” coming down the gully and over the trail. Everyone retreated further up the trail in case there was additional mud/rock fall to come. We weighed our options: wait for the rain to subside, or continue to the trailhead. The backpackers poked their trekking poles at the trail and decided the washout was safe to cross. We followed their lead using the pole and foot placements they had used (kudos to the two folks in our group who helped everyone safely across!). There was a less serious washout at the avalanche chute before the bridge across the Foss River that we traversed without incident. When we arrived at Foss Lake we could see a significant volume of mud starting to flow into the inlets. Back at the trailhead we were concerned that there may have been a road washout and drove out together, but we arrived back at US 2 without incident. I would not have canceled the hike, but having heard the faint thunder we would have been better off skipping the side trip to Copper Lake — we would have been further down the steep trail when the worst of the weather hit.